Discover the beauty of hardwood floors with Discover Hardwood Flooring and Design, Rochester’s choice in quality hardwood flooring sales and contracting services. Discover Hardwood Flooring & Design is a Rochester based, owner operated establishment, providing quality residential and commercial hardwood floor renovations. We offer a wide variety of services specializing in the restoration and refinishing of preexisting hardwood floors, new custom hardwood installations, floor repairs, and quality hardwood flooring sales. We provide quality craftsmanship, with an emphasis placed on exceeding our customer’s expectations. 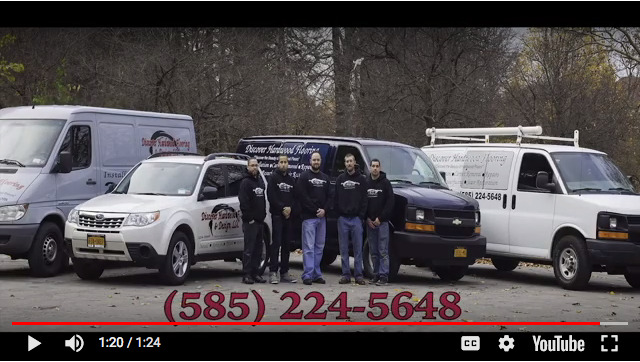 With thousands of satisfied customers served in the Rochester area, we would love to earn your business! Do you have hardwood floors that need to be refinished, or interested in having a new hardwood floor installed? Give us a call today and set up a free in-home consultation. We offer competitive rates, dustless refinishing, superior craftsmanship, and a personalized approach to flooring sales. Owner and operator, Luke Davis, has over 20 years experience in hardwood flooring sales, service, and custom hardwood floor design. We currently serve Monroe County and surrounding areas.